8mm Forum: Best S8 sound editor with bright screen. Author Topic: Best S8 sound editor with bright screen. I'm looking for a bright and good working editor. Now brightness will be better with van Ecks 6V Halogeen version they probably make themself. I had a nice editor Goko A-201, with a bright picture, (van Ecks lamp), but the winders are crap, stuck. My Elmo 912 Dual Type I think doesn't give me that picture. 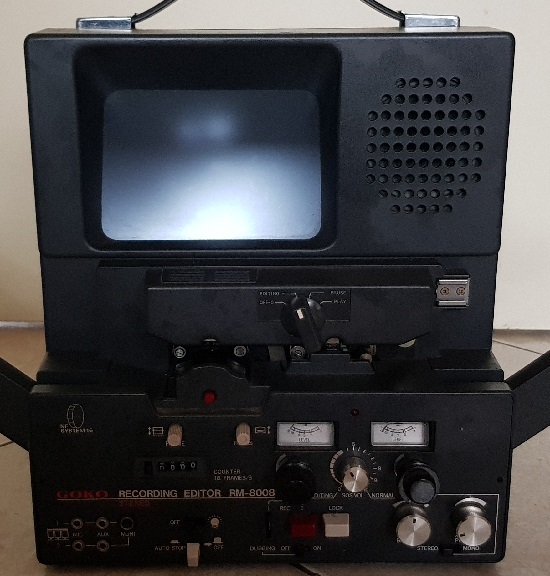 Now I'm looking for a new and better editor and for splicing films to come, a sound editor, with at least the same or better picture quallity of the Goko A-201. I found out Goko has a MR8008 Stereo Edotor. Is this the Rolls Royce of Super8 Editors, or are their much better ones? The Goko Rm8008 is streets ahead of other editors. They crop up on eBay from time to time, expect to pay £60-£150. There is also the Erno RE-904 NF Sound editor with same size screen and Stereo as well. Goko seems the US version and Erno the European version. Is this correct? Are they the same in quallity? Years must have shown by now. Goko 8008 and Erno 904: They are completely the same. When buying one you must note that the picture does not jump up and down. I own several of the Goko 8008/ Erno 904 and two of these editors have that effect. It cannot be repaired. GOKO is good but the prism system makes the picture a bit dim. The prism system is meant to create interlacing between the frames so picture moves smoothly. If you are not looking for a motorized editor...go for Minette...it has a very bright screen and light. So the picture of these two Erno or Goko Stereo editors, are not as bright as that of the Goko A-201 because of the NF? The Elmo 912 hàs some sort of shutter and a darker picture than the Goko A-201. The NF seemed a great addition, but if that makes the picture darker as well I have to search for something better. Goko RM4000 and RM5000 are without the NF function, but some websites say they do. Another thing is that I sometimes need 360m reels as well, but there are none. Some websites claim that the Goko MM1 takes 360m reels, but no sound. Yes the NF (Non Flicker) with the prism system make picture darker. You can only see the picture better from straight 90 degree from the screen. If you move your head a bit, the picture is not clear. I knew some other brand with 1200 capacity like Prinz Oxford 1200. It does not go high for the prize, but I am not sure about the brightness as I never had one. Thans for all the information. I can buy a Goko RM8008 for €50 but the picture has that jump effect. Picture is brighter than that of my MM1. My MM-1 however has also an electrical rewind, while the RM8008 can do this only forward and not back, not sure if this is normal? Is it still worth of buying or will this give problems that I don't think of right now? What is most important to me in a viewer/editor? I have several editors, and I have my favorites, but no one editor is perfect. Elmo 912 - easy to use, so-so dim image with lots of flickering, a workhorse for editing. Goko RM-3003 - easy to use, so-so dim image with lots of flickering, very similar to the Elmo (no surprise since Goko made the Elmo) BUT, it has an electric drive. Priceless for someone like me with a cranky rotator cuff, and had a ton of Super 8mm to edit & splice! Elmo S5 - a huge leap in viewer image quality, probably because of the glass (instead of plastic) lens, the viewing lens is smaller in area than the Elmo & Goko, and perhaps the internal mirrors are higher quality (don't know this for sure). If your can turn the take-up reel crank at the right speed, the image shown the viewer can approach near movie quality. The downsides to the S5 are that, for me, a bit more difficult for manipulating film in editing, and the capacity of the take up arms is limited to 400ft reels. Now, there is a 'mythical' Minette S5 600 that can handle 600ft reels, but I've never seen one except in Minette advertisement flyers. Nevertheless, the Minette S5 will remain when I start reducing my collection of Super 8mm equipment. So, Matthieu, you need to consider what is most important to you in a viewer/editor. My experience is limited to the more popular editors with no sound editing capability, and maybe there is that 'best' viewer/editor for you. I'd guess that your choice will be a compromise in what you want for your use. I subscribe every word spoken on the Goko Rm8008. I have the equivalent Erno and, despite it's the top of the editors, has a DARK screen. Winbert is right, you have to get in that position, otherwise you see very little. Then, in addition to the problem of the shaky image that often happens, it's also very sensitive as regards the audio, on the splices. I opened the thread on the problem of the shake, then I solved buying same Erno, broken, but with working optical bench, and I replaced it. If the Goko/Erno has the shaky image is unusable, it's a not inconsiderable defect. I also agree with the brightness of those Minette S-2, I, in fact, have a Minette (small screen but very clear and very defined, almost like a projector) for the darkest films, and the Erno for the brightest films and for the audio editor. Thanks, I go looking for a better RM8008 than. Matthieu, if some piece should be useful (of course, free), I still have the broken Erno from which I took the optical bench. It misses the sound heads and the aforementioned optical bench, but the rest should be there (power section, screen, various electronics, chassis...). Thank you, I'll keep it in mind. He did also have a Erno 903 (Mono), which have probably the same optical equipment, except for the sounddepartment. I could buy them both, but the whole comes down tyo €100 than. I just boughtr a Goko RM8008 from the marketplace for €32. You have a large sturdy and heavy rewinder as well. It's so easy to clean my films with Filmguard now. I love the bright screen and having sound. It's so easy to put your films on it or from it halfway, because of how the system works. Can Someone tell me where I can mark the film, for splicing? Or is my RM8008 incomplete, see picture? It already misses the left record knob. On my Goko MM1 I have a very easy system for that, not sure if I can put it on this Goko RM8008. About 4 times a second it wows a bit darker, like it adds the old film effect you see in movies sometimes. Is this the NF system or is something else wrong? Seems to me, if it is the NF, shouldn't he do this 24 times a second? Splicing films together is a problem after adding Filmguard, since it won't stick anymore. I had to clean it off with a alcohol tissue for glasses. I did this with the ends of both parts (12 frames or so), and after splicing togetrher, I added Filmguard again and cleaned it. That signs of flickering but it is contradicted with the machine which is a Non-Flickers (NF) system. Can you show it on video to explain what you were talking about. Matthieu, the RM8008 DOESN'T have a tip to mark the film. Strange for an editor of this level, eh ? I remember that the manual said to do it with a pencil (I would do a scan, but I do not have a scanner. However, if you need a particular page I see if I can do it at work.). I have to pay attention to a 4fps you say, because I don't remember. I see if I have the knob that you are missing, if I have it I can send it to you, but consider whether the cost of shipping is worthwhile (Italian post is a bit expensive). I noticed another thing: if you look at your editor compared to the others, you will notice that your two volume knobs are not gray but black. This is because it's evident that on your editor previous user had an accessory that, with an oring, kept the two volume buttons connected, to make them go to the same level. But it's not a problem, you can use those buttons very well. These have a prism for the non flicker effect !!! !, and its made from optical glass, so easily damaged if you clean it. I think you are experiencing some of the flat lenses dusty or dirty from non use, you can clean these with the lens wipes, but be careful, let the solution do the cleaning and don't press too hard, also check the mirror is clean, this has an effect on the brightness of the lamp to screen over all. Using a Chinagraph pencil to mark edit points would have been the professional way of doing it as it can be rubbed off, not by notching the film which would have been considered a low end technique. Matthieu, that 8008 is a nice looking editor! This is the first really good picture of one that I've seen. Can't recall seeing this specific editor for sale on eBay in the U.S.
Looks like this editor has the accessory mount point normally found on Goko, Elmo, etc. viewer/editors. If you can locate one of the hard-to-find film cleaners that fit in this mount, it may make it even easier to clean your films with Filmguard. WOW thanks for all that usefull info. I shall check the mirror and prisma for dust. Seems like the logical explenation. The unit was very dusty wwhen I bought it. Chinagraph pencil,... I'm going to check if I can buy them here as well. @ Kev. I have that cleaning accessoire, but when in use my 1200" reel does not fit. I have a very bright LED version of the MM1, but it shuts down the light when it gets hot al the time, so I turn Off the light when not in use during splicing. I'm going to look if I can put this in the RM8008. I already like the brightnes of this RM8008 already tho. Matthieu, how do you find with the audio? This editor has a fantastic sound, uses the same magnetic heads of the GS 1200, has a superior quality to many projectors. Only thing, the heads are very "pressing" and some splices can not pass perfectly or the recording can change according to the thickness of the film.